Please leave the message to be engraved to the bottle on the note section when you check out. 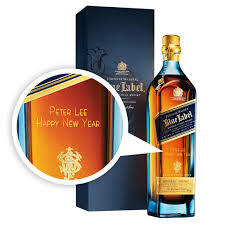 JOHNNIE WALKER BLUE LABEL is a commemoration of Alexander Walker’s remarkable 1867 Old Highland Whisky. Its epic story is one that has seen it travel it from the four corners of Scotland, to the four corners of the earth. Using blending skills learnt from his father, carefully honed through the blending of teas and spices from the New World, Alexander Walker harnessed whisky flavours from across Scotland to craft a blend of truly rare quality and sent it ‘wherever ships could sail’. Crafted in a time of remarkable achievements, in an age that would change the world forever, Old Highland Whisky was seen as a defining statement in whisky excellence and quickly became a dominant force in the global Scotch Whisky market. Alexander’s entrepreneurial vision knew no bounds, and as a result, JOHNNIE WALKER whiskies were being sold in more than 120 countries by 1920 winning worldwide acclaim. Nose : mellow, rounded nose, with a dry smokiness (a JOHNNIE WALKER signature flavour) mixed with raisin sweetness. Taste : The first sip reveals a velvety mouth-feel, then an explosion of flavour – hazelnuts, honey, rose petals, sherry and oranges. Subsequent sips reward you with more hidden secrets like kumquats, wispy aromatic smoke, sandalwood, tobacco, and dark chocolate. Finish : There’s a rich and uniquely long and satisfying finish of smoke and pepper, ending with a glorious touch of spice. Best savoured with the palate cleansed and cooled by iced water.